I have lived in Canada most of my life, and yet I never came across the jewel that is Tofino, B.C. until this past summer. Newly (self-) proclaimed 41-year-old surfer girl that I am, I decided that it was time to find a place to surf that was a little closer to me than Hawaii, and where I didn’t have to worry about how far my quivering Canadian dollar would go. 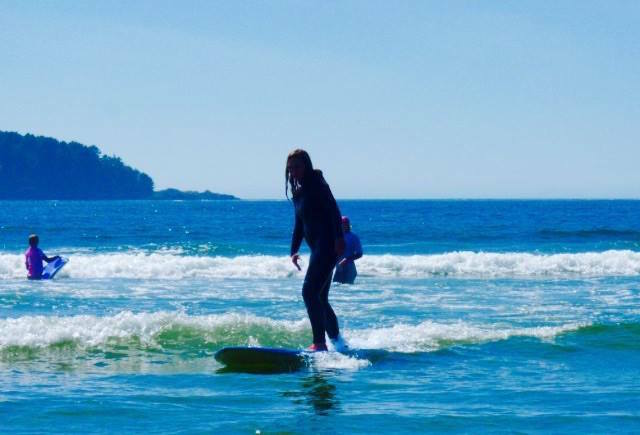 I knew the water was going to be cold when I got to this Canadian surf destination, but I didn’t care—Tofino was calling me. I drove four hours from my home in inland British Columbia to the Horseshoe Bay Ferry terminal in Vancouver, hopped on a two-hour ferry ride to Nanaimo with my good friend and made the three-hour trek from the east side of the Vancouver Island to the west. We drove through old growth rainforests and past mile-long lakes with no one on them as we neared the Mecca of Canadian surfing. As my friend and I drove through the Pacific Rim forest, going in and out of cell service, we talked about what we should do while we were in Tofino. “We have to surf!” she said. I was nervous about the rugged surf conditions. After all, the last time I tried to surf was in the warm waters of Waikiki. All I needed there was my bikini and a 12 foot board from the surf rental stand on the beach. In Hawaii, I just grabbed the board from the cute surf instructor, dragged it 20 feet into the water, and I was off. But here—this was the outback, rugged and unknown. I knew I needed a little extra Tofino TLC. She pulled over to the side of the narrow road to make the call. As soon as the girl at Surf Sister answered I felt at home. Her voice was super cool. I could hear laughter in the background. My tensions started to ease. I could sense the spirit of “girl power” even across the phone. As my friend hung up, we smiled knowingly at each other; we knew it was meant to be. I knew the next day would be one to remember. We spent that night hanging out at the local Tofino watering holes and unfortunately didn’t go to bed at a surf-friendly time. We both woke up the next morning with sore heads and a slight lag in our step. I even contemplated canceling my lesson. But I didn’t. I knew I had to go. I could feel it. Finally, one o’clock came around and it was time to meet my Surf Sisters. As soon as we pulled into the parking lot and I saw all the sea salt tousled, trucker hat wearing, long haired surfer girls loading up the boards in the van, I knew I was home. We pulled our slightly hungover selves out of our car and walked into the shop. I felt the Surf Sister energy immediately. It was so positive, so raw, so adventurous…so…cool. 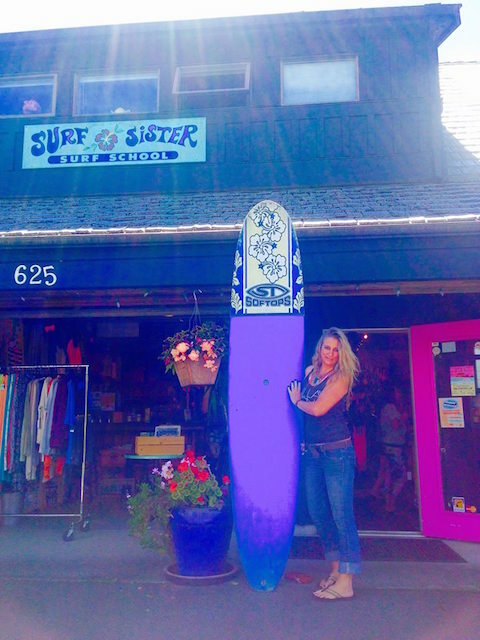 As I filled out my information I talked to several of the Surf Sisters and found out that the school was started by a girl named Krissy Montgomery 14 years prior and now attracts surfer girls from around the world who come there to work. They all seemed so confident, so positive. Their “Surf Sister” energy was contagious. I soaked it up. It seemed that with every second I spent there, I was reminded of who I have always felt I innately was: strong, confident, beautiful. I wished every young girl could have the chance to be in their place. In this Instagram, SnapChat, Facebook, Twitter, Tinder generation, these girls seemed like an antidote to the social media craze that so many of us have fallen prey to, young and old. The Surf Sisters weren’t occupied with taking selfies; they were busy making memories, living, adventuring, surfing. I wanted to bottle their energy and take it home with me so I never forgot it. If hadn’t even started the lesson yet and I felt this good, I couldn’t imagine how I would feel after surfing with them. After I finished filling out my release form, my instructor, “Mouse” from Brisbane, Australia let me know where I was to meet her and the rest of the class. She was raised in Kenya, but from Australia originally, so her accent was unique—exotic and lovely. I drove the five miles down Highway 4 until I found the street Mouse described. It wasn’t long before I saw the Surf Sister van pull up beside me. Mouse jumped out of the van and handed out our wetsuits and booties. She showed us how to “sandwich carry” the boards down to the beach and then it was time to begin our lesson. As I listened to her review how to pop up, I gazed out over the open ocean and took it all in. Pure, unadulterated beauty right in my backyard—well, a seven-hour drive and two-hour ferry ride from my backyard, but compared to Hawaii, pretty close. Mouse had us practice popping up on our imaginary “sand boards” while we were on the beach, and then it was time to hit the open water. I had surfed several times before, but I was still very much a beginner. The nice thing about Tofino waves is that you can actually walk out to the whitewater break and hop on your board when you see a wave coming. I was determined to stand firmly on the board and surf out a whole wave, so I kept Mouse’s advice in mind as I went to find my next wave…and then it happened. I smiled like sunshine was beaming out of my soul. I was in the company of my soul sister Surf Sisters and I loved every second. After the wave finally died down, I turned my head toward Mouse, who was out closer to the green waves. She gave me the biggest smile and the biggest thumbs up. I was on cloud nine! I wish I could have stayed in that moment forever, but I had to get back to the mainland. I will never forget what the Surf Sisters taught me. Girls are meant for so much more than taking the perfect selfie. It’s time for a Surf Sister revolution. Hi Wendy, I really enjoyed your description of surfing, and even the "short" drive to Tofino. It's hard for a born and bred SoCal native to imagine rainforest in Canada! I take issue, though, with the all or nothingness of selfies vs. surfing, or adventure and living life how you want. If you saw my 20 year old daughter on the sidewalk with friends taking selfies, you might miss the girl who's been surfing since she was five, who drove off to Joshua Tree to camp with her best friend, who hopped on a plane with her mom to travel 15 hours to a crazy little island in the Philippines. The beauty is, you can be both. Wendy Haley is a born again lover of life. As well as working in the field of education, she can be found jumping and kicking at the gym, drinking various red wines, sipping very strong coffee and laughing with friends. 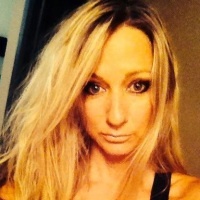 You can check out more of her writing on her Tumblr or visit her Facebook page.